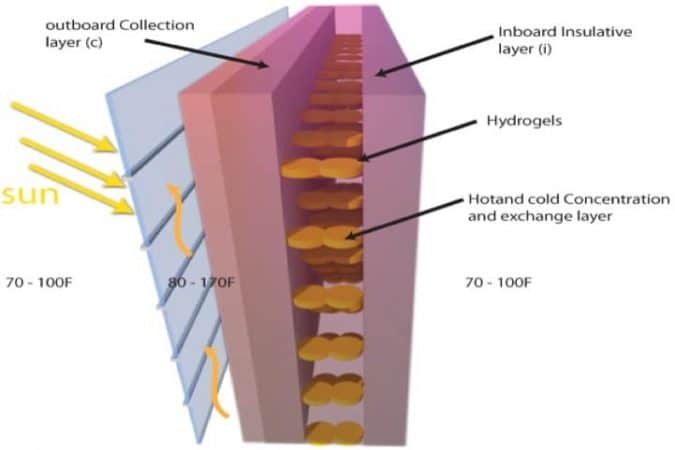 Hydrogel has the ability to cool a room down and that is why it is placed between wall panels. 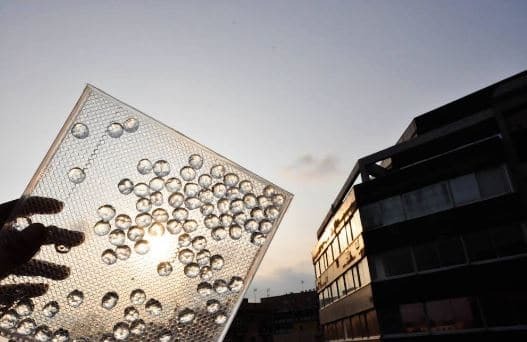 Moreover, hydrogel is an environmentally friendly material that reduces the energy cost that otherwise would be used by supplementary devices to cool down buildings. It is estimated that 100 million tonnes of CO2 is released each year by the use of air conditioning devices. So, the crucial role of such environmentally friendly materials cannot be underestimated. The operation of hydrogel begins after it has been installed between walls panels as shown in Fig.1. Hydrogel bubbles absorb water when the air around hydrogel heats up. It then evaporates the absorbed water and causes the reduction of temperature by up to 5 degree Celsius. This mechanism of temperature reduction is inspired by the mechanism by which the human body cools itself down. Hydrogel could be used to construct a wall that is able to cool itself down. The importance of this characteristic is paramount since significant energy that is consumed by external devices to cool buildings can be cut. Consequently, harmful gas emissions are reduced. The hydrogel bubbles are initially layered between two panels and then placed into the walls. It cools down room temperature by up to 5 degree Celsius. As a result, it leads to a decline in CO2 emission into the air. This is because of the use of an external cooling apparatus is decreased.